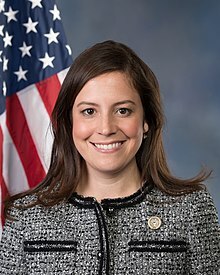 Elise Marie Stefanik (/stəˈfɑːnɪk/; born July 2, 1984) is an American politician serving as the U.S. Representative for New York's 21st congressional district since 2015. First elected at the age of 30, she was the youngest woman ever elected to Congress at the time. At the start of the 115th Congress, she was the youngest member of the House. She is a member of the Republican Party. Elise Stefanik was born in Albany, New York in 1984 to Melanie and Ken Stefanik. Her parents own a plywood business in the Albany area. After graduating from the Albany Academy for Girls, she entered Harvard University, graduating in 2006 with a B.A. in government. While at Harvard she was awarded the Women's Leadership Award. After graduating from Harvard, she joined the administration of President George W. Bush, working as staff to the Domestic Policy Council. Stefanik also worked in the office of the White House Chief of Staff for Joshua Bolten, Bush's second deputy chief of staff. She has worked as communications director for the Foreign Policy Initiative and as the policy director for former Minnesota governor Tim Pawlenty during his 2012 presidential campaign. Stefanik managed Wisconsin congressman Paul Ryan’s debate preparation as he ran for Vice President of the United States in the 2012 general election. Following the Romney-Ryan loss in the 2012 presidential election, she returned to upstate New York to join her parents' wholesale plywood business, located in Guilderland Center. In 2013, Stefanik declared her candidacy in the 2014 election for the United States House of Representatives in New York's 21st congressional district. The district and its predecessors had been in Republican hands for 136 years before Democrat Bill Owens won a 2009 special election and subsequently won re-election in 2010 and 2012. In 2014, Owens opted not to seek reelection following a re-districting that changed the demographics of his district. Stefanik ran on a platform of lower taxes, support for small businesses, and energy. During her campaign, she said: "It's not news to anyone that Republicans have struggled to reach out to voters in my specific demographic: young women who are professional, not married - that was one of President Obama's most enthusiastic voting blocs." One supporter, Chip Kiefer, told the Daily Mail that "everybody's first impression" of Stefanik during the campaign was that she was "just too young." But he, and many others, changed their minds, deciding that "having young energy is a good thing for us." Stefanik ran for re-election in 2016. She ran unopposed in the Republican primary. Stefanik supported Donald Trump for president after he won the 2016 Republican presidential primaries. She faced Democrat Mike Derrick and Green Party candidate Matt Funiciello in the general election. She won re-election with 66%, while Derrick (D) received 29% and Funiciello (G) received 5% of the vote. In June 2017, Ambassador John Bolton endorsed Stefanik for re-election. "Elise Stefanik has proven that she is dedicated to protecting our country and our allies against global threats," said Bolton. "As part of the House Armed Services Committee, Elise Chairs the Subcommittee on Emerging Threats and Capabilities, where she is responsible for overseeing counterterrorism programs and counter proliferation of WMDs." In the general election she won re-election with 56.72% of the vote, Tedra Cobb (D) receiving 41.79% and Lynn Kahn receiving 1.48%. In January 2015, Stefanik was appointed to the House Armed Services Committee. She was elected by the freshman Representatives in the 114th Congress to serve as the Freshman Representative to the Policy Committee. In February 2015, she was appointed vice chairwoman of the House Armed Services Committee's Subcommittee on Readiness. On January 11, 2017, Stefanik announced that she had been elected co-chair of the Tuesday Group, "a caucus of...moderate House Republicans from across the country." According to Stefanik, "'[the] Tuesday Group is comprised of members who are willing to work across the aisles to advance policy solutions for their constituents, and I look forward to working on critical issues facing our nation in this important role.'" In September 2017, the Albany Times Union reported that "Stefanik may be integral to the future of the [Tuesday Group] as some wonder aloud whether it can survive with some of its top members exiting or planning to do so.. Stefanik remains in a position to amplify her voice — for both moderates and [for] her constituents." Stefanik is a member of the Republican Main Street Partnership and the Climate Solutions Caucus. Stefanik led recruitment for the National Republican Congressional Committee (NRCC) in the 2018 United States House of Representatives elections. After the elections, she left the NRCC to found her own group dedicated to recruiting Republican women to run for office. Stefanik was ranked as the 27th most bipartisan member of the U.S. House of Representatives during the first session of the 115th United States Congress by the Bipartisan Index, created by The Lugar Center and the McCourt School of Public Policy to assess congressional bipartisanship. Stefanik voted in favor of the Keystone Pipeline. Stefanik opposed the 2013 sequestration cuts to the federal U.S. military budget, citing its effect on Fort Drum in Watertown, New York, part of her district. She voted against the Tax Cuts and Jobs Act of 2017, joining five other New York Republican representatives. Her primary reason for voting "no" was due to the state and local tax deduction "that so many in our district and across New York rely on." Stefanik also criticized "Albany’s failed leadership and inability to rein in spending." She stated "New York is one of the highest taxed states in the country, and families here rely on this important deduction to make ends meet. Failure to maintain SALT (state and local tax deductions) could lead to more families leaving our region." In a July 2015 profile in The Washington Times, Jacqueline Klimas noted that Stefanik was the only freshman on that year's conference committee for the defense policy bill, a position accorded to her "because of her extensive experience in foreign policy - working in the George W. Bush administration, prepping Rep. Paul Ryan for his vice presidential debates and listening to commanders at Fort Drum in her home district." Jack Collens, a political science professor at Siena College, told Klimas that Stefanik's prize committee position signaled that party leaders wanted Stefanik to be part of "the next generation of Republican leaders." Stefanik united New York House members "to spare Fort Drum from drastic cuts." Instead of a planned reduction of 40,000 troops, Fort Drum ended up losing only 28, making it a standout among stateside Army bases. Stefanik criticized President Donald Trump's decision to withdraw from the Paris climate agreement, saying the decision was "misguided" and "harms the ongoing effort to fight climate change while also isolating us from our allies." In January 2017, Stefanik joined the Bipartisan Climate Solutions Caucus, an apparent indication of "a moderate stance on climate change issues." On May 4, 2017, Stefanik voted on party lines in favor of repealing the Patient Protection and Affordable Care Act (Obamacare) and passing the House Republican-sponsored American Health Care Act. Following a televised community forum in Plattsburgh four days later, in which many attendees opposed her vote and wanted to maintain Obamacare because it was superior, Stefanik said she had been unfairly criticized for her vote for AHCA. She defended her vote in a post on Medium, "Setting the Record Straight on the American Health Care Act." Her claims about the effects of the AHCA have been strongly disputed by journalists' fact-checking from the Glens Falls Post-Star, North Country Public Radio, and the Albany Times Union. Following the constituent backlash over Stefanik's AHCA vote, the Democratic Congressional Campaign Committee added Stefanik to their list of targeted 2018 House races. In 2017, Stefanik co-sponsored the Preserving Employee Wellness Programs Act (H.R. 1313) in 115th Congress – legislation that, among other things, would eliminate the genetic privacy protections of the Genetic Information Nondiscrimination Act of 2008 and allow companies to require employees to undergo genetic testing or risk paying a penalty of thousands of dollars, and would let employers see that genetic and other health information. The bill is opposed by the American Society of Human Genetics. Stefanik opposes abortion, but argues for compassion and understanding of different views. She joined her party in supporting H.R. 36, the Pain-Capable Unborn Child Protection Act of 2017. In November 2017, Stefanik voted for the Championing Healthy Kids Act, which would provide a five-year extension to the Children's Health Insurance Program (CHIP). Stefanik opposed Trump's 2017 executive order imposing a temporary ban on travel and immigration to the United States by nationals of seven Muslim-majority countries. Stefanik declined to condemn the Trump administration family separation policy, instead publishing a press release congratulating Trump after he signed an Executive Order to suspend new separations and detain families. On March 26, 2019, Stefanik was one of fourteen Republicans to vote with all House Democrats to override President Trump's veto of a measure unwinding the latter's declaration of a national emergency at the southern border. Stefanik voted to release the Nunes memo written by staff members of Republican U.S. Representative Devin Nunes. President Trump asserted that the memo discredited the investigation into Russian interference in the 2016 United States elections, but the FBI asserted that "material omissions of fact...fundamentally impact the memo's accuracy." Stefanik supported the ending of the House Intelligence Committee's investigation into Russian interference in the 2016 United States elections over the objections of Committee Democrats. On Tuesday, December 19, 2017, Stefanik voted against the Tax Cuts and Jobs Act. In a December 18 Facebook post, Stefanik asserted that "the final bill does not adequately protect the state and local tax deduction that so many in our district and across New York rely on ... New York is one of the highest taxed states in the country, and families here rely on this important deduction to make ends meet." After the FCC decided to repeal Obama-era net neutrality in December 2017, Stefanik urged her congressional colleagues to pass legislation restoring the policy. In September 2018, Stefanik co-sponsored, together with Seth Moulton and Dan Donovan, the "Cyber Ready Workforce Act" advanced by Jacky Rosen. The legislation would create a grant program within the Department of Labor to "create, implement and expand registered apprenticeships" in cybersecurity. It aims to offer certifications and connect participants with businesses in order to "boost the number" workers for federal jobs in said trade. Stefanik moved into the 21st Congressional District immediately prior to beginning her first campaign. Her official residence was in Willsboro, New York, where her parents had owned a vacation home for many years. As of April 2014, she owned a minority interest in a townhouse near Capitol Hill in Washington, D.C., valued at $1.3 million. Stefanik is married to Matthew Manda, a communications and marketing vice president at Firehouse Strategies. In December 2018, Stefanik and Manda moved to Schuylerville, New York. ^ Stefanik won the election at age 30. Previously the youngest woman to win an election to Congress was Elizabeth Holtzman, who was 31 when first elected in 1973. ^ LoGiurato, Brett (November 5, 2014). "Elise Stefanik Wins, Now Youngest Member Of Congress". Business Insider. Retrieved November 6, 2014. ^ LoTemplio, Joe (October 6, 2014). "Stefanik delivers national radio address". Press-Republican. Plattsburgh, New York. Retrieved October 9, 2014. ^ "NYCFPAC Endorses Elise Stefanik for Congress in New York's 21st Congressional District". New Yorkers for Constitutional Freedoms Political Action Committee (NYCFPAC). Lima, New York. Archived from the original on February 16, 2015. Retrieved February 15, 2015. ^ a b c d e Jamie Weinstein. "Elise Stefanik wants to go to Congress". The Daily Caller. Retrieved June 25, 2014. ^ a b "Congressional challengers line up » Sunday". Press-Republican. August 18, 2013. Retrieved June 25, 2014. ^ "Congressional Quarterly: New Members of Congress (2014)" (PDF). Congressional Quarterly. Retrieved 16 December 2017. ^ Toczauer, Nicole (October 4, 2014). "Meet Elise Stefanik, the Candidate Who Could Become the Youngest Woman in Congress". ABC News. New York. Retrieved October 4, 2014. ^ "Harvard Gazette Archives". Harvard University Gazette. Cambridge, Massachusetts. Retrieved October 5, 2014. ^ a b c "Elise Stefanik declared winner of GOP primary in NY-21". syracuse.com. Retrieved June 25, 2014. ^ a b Hagerty, Meg (May 4, 2014). "Stefanik's campaign ramping up". Glens Falls Post-Star. Glens Falls, New York. Retrieved October 5, 2014. ^ a b Center, Shira T. How Elise Stefanik Became the Youngest Woman Ever Elected to Congress, Roll Call, November 12, 2014. ^ a b ABC News (2014-11-05). "Elise Stefanik, the Youngest Woman Ever Elected to Congress – ABC News". ABC News. Retrieved November 6, 2014. ^ NCPR News (July 5, 2016). "Rep. Elise Stefanik will support Trump in presidential election". North Country Public Radio. Retrieved August 25, 2016. ^ Harding, Robert (May 16, 2016). "GOP pounces after Democrats don't elevate Mike Derrick, NY-21 candidate". The Citizen. Retrieved May 24, 2016. ^ "NY21 Can Matt Funiciello Build a Bernie Style Movement in the North Country". North Country Public Radio. Retrieved June 29, 2016. ^ Morelli, Marie (November 8, 2016). "Elise Stefanik wins re-election to Congress representing North Country". Syracuse.com. Retrieved November 9, 2016. ^ "New York's 21st Congressional District election, 2018 - Ballotpedia". Ballotpedia. Retrieved 2018-11-07. ^ Earle, Geoff (January 7, 2015). "Youngest-ever congresswoman stands out on first day in office". New York Post. New York, New York. Retrieved January 7, 2015. ^ "Biography". Elise Stefanik's Congressional Website. Washington, D.C. Retrieved January 16, 2015. ^ Flatley, Daniel; White, Perry (February 5, 2015). "Stefanik named to leadership post on subcommittee". Watertown Daily Times. Watertown, New York. Retrieved June 23, 2015. Military readiness, training, logistics and maintenance issues and programs, military construction, installations and family housing issues, and the BRAC process are all part of the subcommittee’s purview. ^ a b Thompson, Maury (January 11, 2017). "Stefanik selected as co-chairwoman of moderate GOP policy caucus". The Post-Star. Retrieved January 7, 2018. ^ a b Hamilton, Matthew (September 18, 2017). "Stefanik charts path for moderates amid Washington partisanship". Times Union (Albany). Retrieved January 7, 2018. ^ "The Lugar Center - McCourt School Bipartisan Index" (PDF). Washington, D.C.: The Lugar Center. April 24, 2018. Retrieved July 3, 2018. ^ "Report: Stefanik ranked among the most bipartisan members of Congress". Elizabethtown, New York: The Sun. April 26, 2018. Retrieved July 3, 2018. ^ a b "NY Rep. Elise Stefanik Reacts to State of the Union". Plattsburgh, New York: Nexstar Media Group WVNY. January 20, 2015. Retrieved February 5, 2015. ^ Harding, Robert. "HOW THEY VOTED: NY GOP reps split on $1.5 trillion tax bill". Auburn Citizen. Retrieved 21 December 2017. ^ DeWitt, Scott Willis, Karen. "Retribution Planned for New York Congress Members who Voted for the Tax Bill". WAER. Retrieved 21 December 2017. ^ Robert Harding (June 2, 2017). "GOP Rep. Elise Stefanik: Trump withdrawing from Paris Agreement is 'misguided'". Auburn Citizen. ^ Staff, C.N.N. "How every member voted on health care bill". CNN. Retrieved 2017-05-04. ^ Community Forum with Elise Stefanik, Mountain Lake PBS. The event took place on May 8th and was broadcast May 10th, 2017. ^ Stefanik faces an angry, emotional crowd at Plattsburgh forum by Zach Hirsch, NCPR, 5/9/17. ^ Stefanik gets an earful on health care at town hall by Josepha Velasquez and Dan Goldenberg. Politico, 05/08/2017. ^ Setting the Record Straight on the American Health Care Act by Elise Stefanik, Medium, May 15, 2017. ^ "Stefanik trades blows with critics" by Joe Lotempolio, Adirondack Daily Enterprise, May 18, 2017. ^ "Looking closer at Stefanik's health care answers", by Kathleen Phalen Tomaselli, Post Star, May 10, 2017. ^ Fact check: Do Rep. Stefanik's claims on healthcare hold up? by Lauren Rosenthal, NCPR, May 16, 2017. ^ DCCC targets Stefanik by Maury Thompson, Post-Star, May 22, 2017. ^ "ASHG Opposes H.R.1313, the Preserving Employee Wellness Programs Act Bill Would Undermine Genetic Privacy Protections", American Society of Human Genetics, March 8, 2017. ^ "H.R. 36 | Congressional Chronicle | C-SPAN.org". www.c-span.org. Retrieved 2017-11-25. ^ Dervishi, Kay; Parrott, Max; Adler, Ben (June 19, 2018). "New York Republicans won't criticize Trump for child separation policy". City & State New York. Retrieved June 22, 2018. ^ Mann, Brian (June 21, 2018). "Stefanik draws fire for handling of family separation at border". North Country Public Radio. Retrieved June 22, 2018. ^ Brufke, Juliegrace (March 26, 2019). "House fails to override Trump veto on border wall". The Hill. ^ Mann, Brian (February 2, 2018). "Stefanik voted to release controversial memo, despite FBI's "grave" concerns". North Country Public Radio. Retrieved February 8, 2018. ^ Farias, Cristian (January 24, 2018). "Why an Unreleased 4-Page Memo From Devin Nunes Is Causing a Frenzy on the Right". New York Magazine. Retrieved February 8, 2018. ^ Griffiths, Brent (February 3, 2018). "Trump: Nunes memo 'totally vindicates' me". POLITICO. Retrieved February 9, 2018. ^ Herb, Jeremy (February 1, 2018). "Schiff accuses Nunes of altering memo before sending to White House". CNN. Retrieved February 9, 2018. ^ WWNY (March 13, 2018). "Stefanik Says It's Time To End House Probe, Supports Mueller Investigation". Retrieved March 13, 2018. ^ Memoli, Mike (March 13, 2018). "House Republicans say investigation found no evidence of Russia-Trump collusion". Retrieved March 13, 2018. ^ Phalen-Tomaselli, Kathleen (December 19, 2017). "Rep. Stefanik votes 'no' on tax bill". The Post-Star. Retrieved January 7, 2018. ^ Thomsen, Jacqueline (2018-09-13). "Dem introduces bill to create federal cybersecurity apprenticeship program". The Hill. Retrieved 17 September 2018. ^ NY21: "Is Elise Stefanik a fresh new voice or a carpetbagger?" by Brian Mann, NCPR, May 20, 2014. ^ "21st Congressional hopeful Elise Stefanik visits Saratoga County". Saratogian.com. June 19, 2014. Retrieved June 25, 2014. ^ "New York GOP House candidate has history of late property tax payments". TheHill. April 29, 2014. Retrieved June 25, 2014. ^ Weddings: "Elise Stefanik, Matthew Manda", The New York Times. Retrieved August 20, 2017. ^ "Our Team - FIREHOUSE Strategies". "Elise M. Stefanik: Writer Profile". The Harvard Crimson.